Maureen O’Hern Hahn, CFA® is the founder and principal of Encore Financial Group, LLC. She is a veteran investment analyst with a broad financial management background. 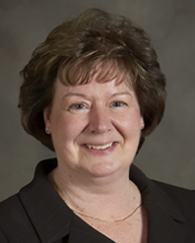 Maureen brings a variety of professional experience to her practice. She began her career as an investment analyst, helping manage equity portfolios for Aid Association for Lutherans (now Thrivent Financial for Lutherans, a Fortune 500 financial services organization). She was instrumental in helping establish the AAL Mutual Funds (now the Thrivent Mutual Funds) and helped build and manage the operation supporting investors and registered representatives. As a faculty member for the Study Seminar for Financial Analysts™, Windsor, Ontario Canada, she taught portfolio management, ethics and accounting to CFA® candidates. She served as a consulting faculty member with AAL Capital Management Corporation and helped create and manage another registered investment advisory firm prior to establishing Encore Financial Group. She is experienced in tax preparation for individuals and small businesses. Maureen currently serves on the Board of Directors of National Mutual Benefit, a fraternal benefit organization located in Madison, Wisconsin, where she also chairs their Finance and Investment Committee. Maureen appreciates the need to stay current with the changes in the financial arena. She maintains her commitment to ongoing education through a variety of reading, professional associations and attendance at seminars. Maureen earned her MBA from the University of Wisconsin – Oshkosh and holds BS degrees in Finance and Accounting from the University of Wisconsin – Green Bay. She holds the Chartered Financial Analyst designation, is a Registered Investment Adviser Representative, is a Fellow of the Life Management Institute, FLMI and previously passed the Registered Tax Return Preparer examination. She is a member of the CFA Institute, the Financial Planning Association and has completed the course of study preparing her to take the Certified Financial Planner™ certification. She believes in the importance of giving back to the community. Maureen currently serves on the Central Region Boy Scouts of America Finance Taskforce, chairs the Bay-Lakes Boy Scout Council Trust Committee and sits on the Northwestern Great Lakes Girl Scout Council’s Investment, Audit and Finance committees. Previous volunteer roles have included board and leadership positions with Northwestern Great Lakes Girl Scout Council, Bay-Lakes Boy Scout Council, Mount Tabor Center, BEAMING, Inc., The Women’s Fund for the Fox Valley Region, Community Clothes Closet, Fox Valley Literacy Coalition, AAL Credit Union and her church. She has worked with the TCE Volunteer Tax Network, the UW-Fox Valley e.a.t.s event, and has been active in a variety of school and church organizations.